The School of Science has a strong commitment to providing both staff and students with the support they need to undertake their research activities. Research students and staff also have access to an abundance of resources and guidance via the University’s Research Intranet. This website introduces our Graduate Research School, a service centre that supports and develops research students through face-to-face and online training, mentoring, seminars, academic events and social activities. The Research Intranet also features the Office of Research and Innovation, a centre that supports and advises research staff on issues like research ethics, commercialisation and funding opportunities, and provides professional development opportunities. 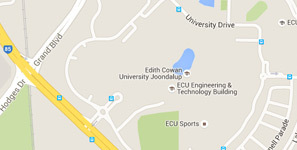 ECU has a commitment to ensure the conduct of ethical research by staff and students. protection of the welfare and the rights of human participants. Ethics approval protects participants (human or animal), the researcher, the University and the community in general. Ethics advice and support for students and staff is provided by the Office of Research and Innovation. A dedicated Research Writing Consultant is available to help research students and staff to improve their writing skills, as well as a Research Consultant/Statistician who can provide support to those who want to improve their quantitative and statistical analyses. Both the Research Writing Consultant and Research Consultant/Statistician run activities and workshops to support our researchers.